County Durham correspondent Tony Eales reports encouraging numbers turned out for today's inaugural lunchtime concert at East Durham College. From the stage of the Lubetkin Theatre (named after Berthold Lubetkin, the man responsible for the original post-war master-plan for the new town of Peterlee) Emma Fisk introduced pianist Paul Edis who played a one-hour solo piano set. Eales noted one or two of Edis' compositions, a few standards and, this is becoming a habit (and a welcome one at that), Dr Edis sang a couple of songs including It's Only a Paper Moon. More, please, Dr Edis! 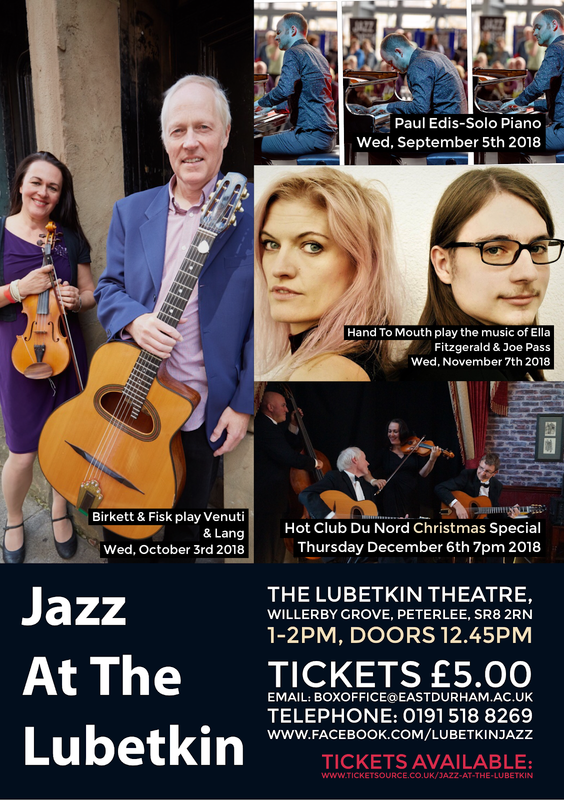 There will be more 'Jazz at the Lubetkin' on Wednesday, October 3 at one o'clock when violinist Fisk herself will play the music of Joe Venuti & Eddie Lang in a duo with master guitarist James Birkett.